In 1877 Thomas Edison invented the phonograph (also later known as a gramophone or record player), a device that was to be used for the mechanical recording and reproduction of sound. Originally Edison intended to use his new creation as an “office dictation” device, however it quickly became obvious that its use for entertainment was more preferred, as others looked for ways to monetise the invention. A little over a decade later, on the 23rd November 1889, Louis Glass and William Arnold modified the phonograph adding a coin-slot and multiple “listening tubes”, demonstrating it at the Palais Royal Restaurant. This was before the phonograph featured a loudspeaking horn. Users of this invention would need to insert a coin and crank a lever to listen to the music. These early modified phonographs encouraged people to buy their own phonographs for home entertainment. In 1918 Hobart C. Niblack patented a device that was capable of automatically changing records. One of the first selective jukeboxes, an automatic phonograph, was then manufactured in 1927 by The Automatic Musical Instrument Co.
With the invention of radio in the 1920s, the record industry began to suffer and it began to look as though the jukebox would never become the huge part of popular culture that it went on to be. It was the Great Depression of the 1930s that improved things for the record industry, as people began to search for cheap forms of entertainment. Towards the end of the depression era, most phonographs started to feature dance records in order to cheer up the listeners. By the end of the 1930s, listening to a jukebox became fashionable and a large percentage of record sales were made up from records bought for use in a jukebox. Styling of the jukebox gradually changed from the plain wooden boxes of the early 1930s to the marbled plastic and flashing lights. The term jukebox wasn’t heard until the 1940’s when Americans began to use the words in conversation. Jukeboxes were found in “juke joints” an informal establishment featuring music, dancing, gambling, and drinking. With its cool new name, jukebox popularity boomed and jukeboxes made by brands such as Wurlitzer and Rock-O-La could be found in almost every bar or restaurant across the United States. By the middle of the 1940s, three-quarters of the records produced in America went into jukeboxes. 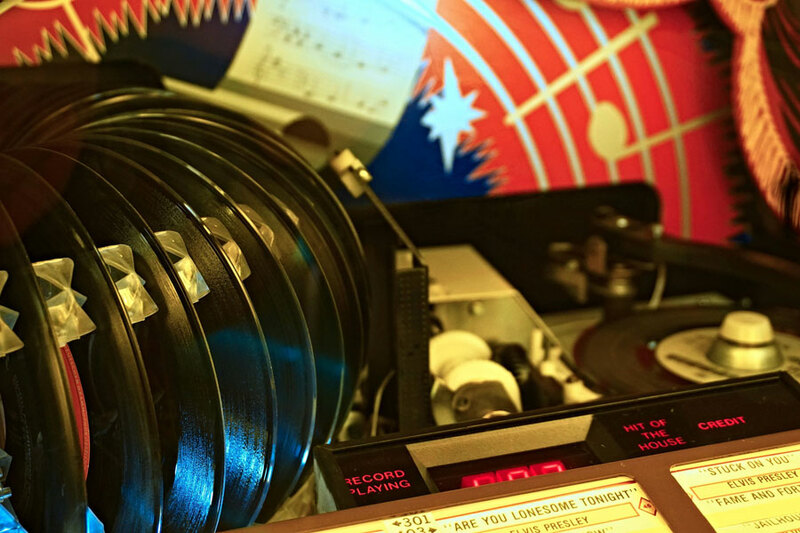 During the 1940s and 1950s the jukebox continued to thrive, incorporating technology such as neon lights and small wallboxes; allowing users of the jukebox to control the machine remotely, selecting songs from the comfort of their table or booth. Originally, jukeboxes played 78rpm shellac records, until the 1950s when The Seeburg Corporation created the first 45rpm vinyl record playing jukebox. In the 1960s stereo sound became popular and wallboxes of that era were updated to include built in speakers, these provided the people of that era the best experience through the latest technology. Popularity counters for each song would inform the jukebox owners how many times each record had been played (not distinguishing between A & B sides), allowing for them to update the machines with new music whilst more popular records could remain. Throughout the 1970s jukeboxes remained a part of popular culture, but there were no major updates to the technology until the late 1980s. Then Wurlitzer introduced the first compact-disc jukebox, bringing with it a major upgrade in the clarity of sound being broadcast to listeners. Towards the end of the 20th century, digital jukeboxes using an MP3 format were manufactured. Allowing for music selection and playback to be conducted by a dedicated proprietary computer. This invention brought with it a much greater selection of music and flexibility for the jukebox operator. Nowadays, a digital jukebox is typically operated via a touchscreen or mobile phone, can store thousands of songs, take photographs, sync to your television, or perform many more of the operations required. Needing less space and costing less to operate, with the ability to adapt to its consumer base, the digital jukebox has indeed solidified its rise into the 21st century.